We made this cake for the assessment before the exam. It’s really delicious and personally, I think this cake is more difficult to make than a classic opera cake. This cake is made of Almond Joconde (imbibed with rum syrup) with nuts ,layered with Rum Praliné Mousseline A l’anglaise and Apricot Compote. Garnished with caramelized dry apricot, pistachios and hazelnuts. 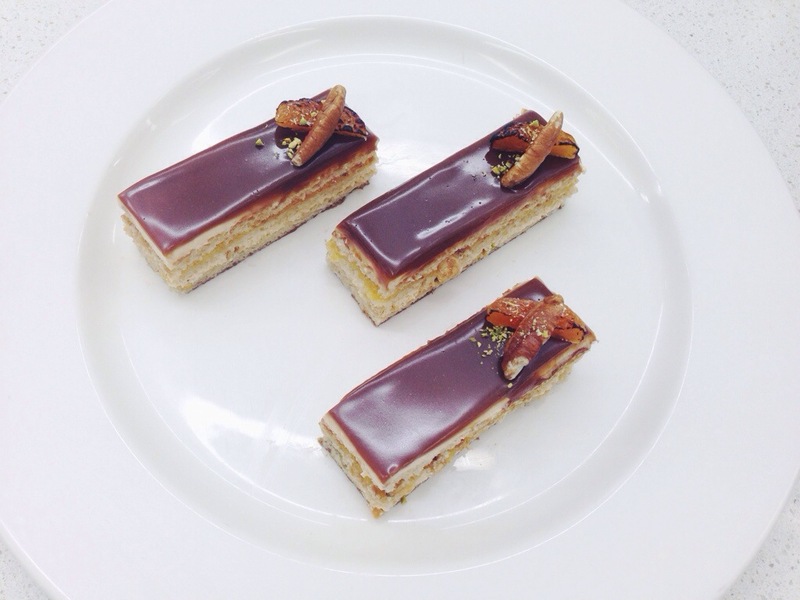 The way we assemble this cake is similar to the way we assemble an opera cake. It’s the same technique, different products. Almond joconde in this recipe is made of brown sugar, icing sugar, plain flour, ground almond combined with a plain meringue. Rum Praliné Mousseline A l’anglaise is made of creme anglaise mixed with butter, praliné and rum, combined with a plain meringue.